It's nearing the end of summer...thank goodness. While this means triple digit heat is hopefully behind us, its still hot. Good news though, end of the season sales. 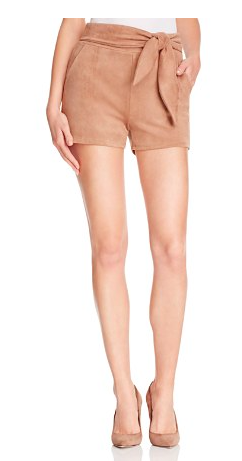 I'm loving the tie waist shorts right now because they're playful, effortless, and on major sale. In fact all of these options are under $35! A deep navy and white stripe will look great with a tank top and throw on a denim jacket in the evening. This is how you dress up shorts. Some heels, a great clutch, and confidence. Who isn't sick of cobalt? Right. It's awesome. And check out the paper bag waistline detail. Date night, drop jaw look. Also comes in black. So don't think summer shopping is over just yet! Now is the time to score some major deals on some great staple pieces like a tie waist short for under $35.